As a young up-and-comer, the heavy-handed Sicilian who breezed through his amateur career undefeated, Juiseppe Cusumano promised his coach and mentor, Robert Matney, he’d one day win a world title. When Matney, a former Chief Petty Officer in the U.S. Navy, died unexpectedly in 2014, Cusumano’s career took a turn for the worse. The promising heavyweight struggled with alcohol abuse and sat on the shelf for more than two years, the victim of a shady manager who robbed him of most of his earnings without booking him any fights. There were days Cusumano struggled to get out of bed. Friends and family urged him to give up boxing a find another career. But Cusumano refused to throw in the towel. He had a promise to keep. Next Saturday at Twin River Casino Hotel, Cusumano (17-2, 15 KOs) finally has the opportunity to cash in when he faces Brendan Barrett (7-1-2, 5 KOs) of Ventura, Calif., in an eight-round showcase for the vacant National Boxing Association (NBA) World Heavyweight Title, one of three title bouts at CES Boxing’s 2019 season opener. The NBA, dormant for more than six decades after it changed its name to the World Boxing Association (WBA) in 1962, has returned under the direction of its new president, Damon Gonzalez. The Feb. 23rd Cusumano-Barrett showdown is the first NBA heavyweight championship bout since 1951 when the legendary Jersey Joe Walcott knocked out fellow Hall of Famer Ezzard Charles at Forbes Field in Pittsburgh. The list of former NBA heavyweight champions includes 11 Hall of Famers, among themJack Dempsey, who won the inaugural title in 1921; Gene Tunney; Max Schmeling; Jack Sharkey; Max Baer; Jim Braddock; Joe Louis; Floyd Patterson and the iconic Rocky Marciano, Cusumano’s idol as a young fighter. Marciano won the World Heavyweight Title in 1952, stopping Walcott in the 13th round of their scheduled 15-round fight in Philadelphia. He defended it six times before retiring at 49-0 in 1955. Other sanctioning bodies existed at the time, including the New York State Athletic Commission, which dissipated in the early 1960s with the formation of the WBC, and the European Boxing Union, but the NBA was the first of today’s major sanctioning bodies to recognize world champions and its history is indisputable. The opportunity to wear that belt and join a list of champions that includes names such as Schmeling, Louis, Patterson and Marciano is a dream come true for Cusumano. “It’s something I really need to get,” Cusumano said. 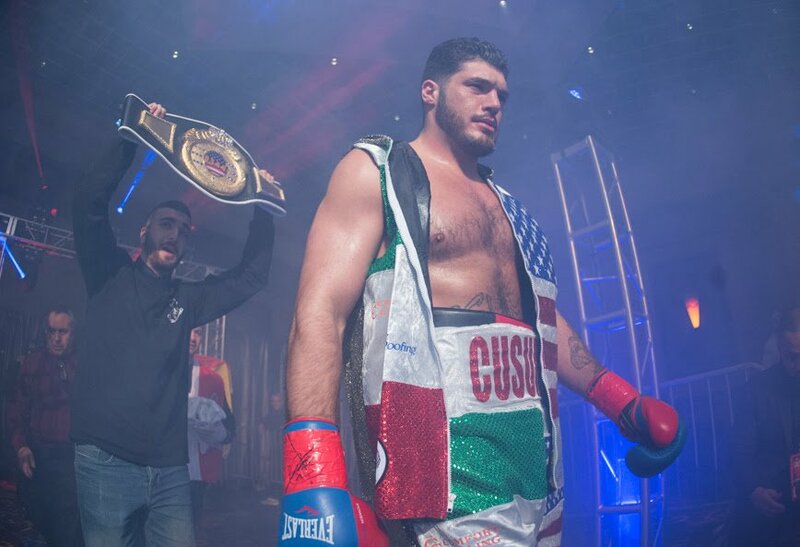 Reunited with trainer Marcus Luck, Cusumano continues to get stronger and leaner with each fight camp, shedding the excess weight from his year-long layoff between 2016 and 2017. He has implemented new techniques into his training regimen and enters next weekend in the best shape of his life as he aims for his 16thwin in his last 17 fights. “With CES signing me [in 2017] it’s really helped me out because they have watched the process of me growing back into the fighter I should be,” said Cusumano, who has fight eight times in the last 17 months since joining forces with CES Boxing president Jimmy Burchfield Sr. “Even though I’m not 100 percent there yet, you can see the process. Each time, I’m getting better and better and my body is getting better. Cusumano struggled early in that fight with the southpaw Marquez before extending his then 12-fight win streak with a fourth-round knockout, but his run came to an unexpected halt less than a month later when he lost to the slick and surprisingly-elusive Robert Simms by unanimous decision. Cusumano still feels he won that fight, but admits the awkward 5-foot-11 Simms frustrated him by landing quick shots to the body, then holding on for dear life, not allowing the 6-foot-4 Sicilian to use his height and reach to his advantage. His opponent next weekend is the same height as Simms, which may initially raise eyebrows, but Cusumano insists there are several differences between Barrett and Simms, many of which may play into his favor on the 23rd. Cusumano and Barrett have combined for 20 knockouts in their careers, 15 for Cusumano and five for his opponent. Neither have been knocked out. Cusumano is confident he can use his jab more effectively than he did against Simms and use it to set up his knockout punch — the “bang-bang, night-night,” as he calls it — similar to the way he finished Marquez in May after three sluggish rounds. Twenty-two-year-old Worcester, Mass., prospect Jamaine Ortiz (9-0, 4 KOs) faces 21-year-old Oxnard, Calif., standout Ricardo Quiroz (10-0, 5 KOs) in an eight-round bout on the main card of CES Boxing’s 2019 season opener for the vacant WBC World Youth Lightweight Title. Headlining is female featherweight sensation Shelly Vincent (23-2, 1 KO) of Providence, R.I., by way of New London, Conn., who faces Budapest veteran Edina Kiss (15-9, 9 KOs) in an eight-round rematch of their 2015 bout, won by Vincent by majority decision. Tickets for the event start at $47 and are available online at www.cesboxing.com or www.showclix.com or by phone at 401-724-2253/2254. Next weekend’s event also makes history as part of the world’s first ultra-high definition, high dynamic range — also known as 4K — event streaming live via VIVE Network TV. The VIVE app is available on Amazon Fire TV, Apple TV, Google Play (Android TV), iOS, Roku and all smart TVs. Visit https://tickets.vivetv.network to purchase. Doors open at 6 p.m. ET and the first preliminary bout begins at 6:30. VIVE will stream two bouts for free on Facebook beginning at 8 before the 4K televised pay-per-view main card kicks off at 9. All fights and fighters are subject to change. Also on the main card, female super bantamweights Marcia Agripino (3-1-1) of Ledyard, Conn., and Boston’s Amanda Pavone (6-0, 2 KOs) face one another in an eight-round bout for the vacant New England Championship. Taunton, Mass., welterweight Marqus Bates (5-2, 3 KOs) faces Jair Ramos (5-2-2, 2 KOs) of Waterbury, Conn., in a six-round bout and super lightweight Nicholas Briggs (2-0, 2 KOs) of Worcester puts his unbeaten record on the line against Andy Aiello (1-1-1) of Bridgewater, Mass., in a four-round bout. Unbeaten Pawtucket, R.I., super featherweight Ricky Delossantos (6-0, 1 KO) returns in his toughest test to date against U.S. Army National Guardsman Javar Jones (7-1, 2 KOs) of Indianapolis. Providence junior middleweights Victor Reynoso (2-0, 2 KOs) battles 1-0 John Williams of Baton Rouge, La., who scored a knockout win in his pro debut in August, while fellow unbeaten junior middleweight Lamont Powell (2-0, 1 KO) of Providence faces 29-year-old Kenneth Chery (1-1, 1 KO) of Montreal Quebec. Likewise, Providence lightweight Michael “Bling Bling” Valentin( 4-0, 1 KO) returns from a one-year layoff to face Philadelphia’s Christopher Burgos (1-3-1, 1 KO) in a four-round bout and decorated New York City amateur Arnold Gonzalez makes his long-awaited professional debut in a four-round super lightweight bout against Falls Church, Va., veteran Stacey Anderson (0-4).